instability it causes, which is the notion that one can hold greater influence over another. Therefore, power is often misperceived as a negative idea. In this sense, there is a great need in whether or not the original structure should be maintained, or whether hierarchy should be abolished in order to strengthen innovation potential. continues to influence the society present day. It is known that the army-fashioned, absolute obedience culture was rooted in Korea from a military government that was in charge for a long period of time. The notion ‘a higher position offers greater power’ has made people evaluate each other by academic levels and obsess over the public examination system. form of discrimination. Such distorted thoughts were generated in the past and have continued until today. The problem is well shown in recent issues through CEOs abusing their power, victims of the #MeToo movement, and malpractices in medical surgery. specific cases. The candlelight vigil has become another noticeable case of pester law. Citizens do not normally ask the government for a change, but they protest. It is because the government is not sensitive enough to citizens’ opinion and refuses to modify the law”, said Professor Kim Myung-soo, a Sociology Professor of the College of Media Information at Hanyang University (HYU). Which System Urges Power Abuse? can depend on,” said Professor Lee Jinsu, a Guest Professor at the College of Policy Science, HYU. Due to the dilemma caused by this law, an endless debate has surrounded the question of whether to maintain or to abolish the libel law. that plaintiffs face multiple failures in their lawsuits. Another example is when benefits differ based on an individual range of power, which leads to an infringement on human rights. These issues above, are also forms of abusing power. benefit of the patient but not switched,” added Professor Lee Jin-su. an ambiguous outline of the ‘burden of proof’. On the bright side, such ‘celebrity benefits’ or ‘celebrity VIP treatments’, actually brought up people’s courage to try to fight more against discrimination. After this incident, many appeared to call for a new amendment; a more righteous law in regard to the burden of proof. In 2016, after a renowned singer, Shin Haechul, passed away because of medical malpractice in 2014, citizens’ resentment caused the government to modify the law (commonly known as Shin Hae-chul Law, Medical Accident Damage Relief and Medical Dispute Adjustment Method). After this amendment, a 57.2% growth in lawsuit commences were shown in a medical poll last year. Another example, in addition to the discussion of medical malpractices is damages occured at work. Workers in Korea can make claims about injuries, disabilities caused by illnesses, and death, but the Labor Standards Act does not mention the definition of what an ‘accident during duty’ is and this makes the patients difficult to define their scale of damage. Korean government̓s response towards the numerous recent incidents about power abuse was only temporary, with light punishments but no reform on any policies. Additionally, victims are having a hard time dealing with unknown ‘secondary damages’. incidents is that there is nothing against power abuse as a whole, along with soft punishment. The endless irony of power abuse in the social hierarchy cannot stop the ongoing injustices. On the contrary, bigger problems have occurred with the victims. The victim in the ‘Nut Rage’ incident, Park Changjin, the ex-office manager of Korean Air, revealed that he experienced constant bullying from Cho Hyun-a, and due to it he had to recieve a tumor surgery. However, he never ended up receiving an apology. Another anonymous victim, Mr. Hwang, was attacked by violent assault from Jung Wu-hyun, the CEO of Mr. Pizza. He said he was asked to leave his job, which left him having a hard time getting a new one. The increasing number of absurdities and discrimination by the authorities cannot only be analyzed by systematic factors, but also by internal factors of both the assailant and the victim. Furthermore, such a social atmosphere negatively affects an individual’s psychology. 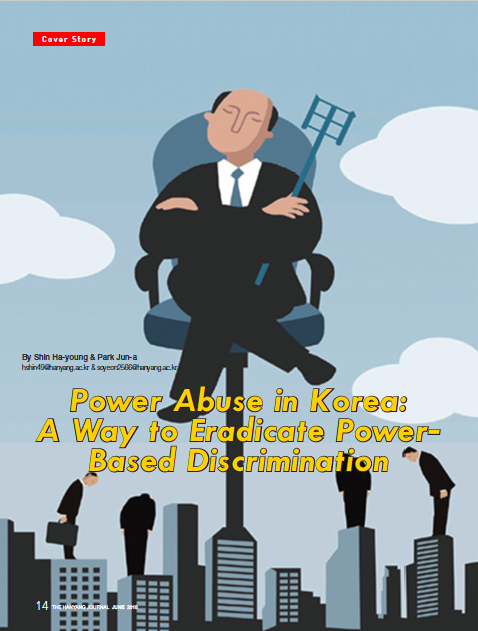 “It is difficult for people without authority to resist against the abuse of power in a culture where there is a strong root for the silent social commitment of pursuing power that already exists,” elaborated Professor Kim Hack-jin, from the Department of Psychology in Korea University. Looking at the abuse of power by Lee Jae-hwan, the CEO of CJ Power Cast, last April, even though the secretary was treated as a servant, the employee had no doubts about complying with his boss’ request. The analysis of the psychology of people in authority shows the reason for the ongoing negative consequences of power abuse. To begin with, power abuse can be explained with the idea of ‘approval addiction’. The ones with power experience a withdrawal of a ‘social reward’ as they are used to receiving respect from others. Therefore, they feel disappointed and unsatisfied with general appreciation, which leads them to desire greater respect, resulting in power abuse. “In the human brain, when an access circuit, seeking to achieve recognition, operates more excessively than an avoidance circuit, which tends to avoid criticism from others, an individual then starts seeking for greater rewards due to dopamine, the key neurotransmitter that operates the access circuit. However, at the same time, the individual becomes insensitive to punishment, criticism, or loss. Therefore, people who stay in positions of power for a long time have a relatively less chance of being exposed to criticism, making it difficult for avoidance circuits from controlling the access circuits. This leads to an excessive desire for recognition, which causes ‘approval addiction’ when it gets worse,” said, Professor Kim Hackjin. On the other hand, victims with less power have no other choice but to surrender to those taking advantage of their power, especially the ones who may affect the victims’ lives. Thus, it is easy to understand why a board member of the Hanjin Group, who was assaulted and whose business was obstructed by the former executive director, Cho Hyunmin, did not stomp out of the room at that time. “In reality, if you become a victim of power abuse, you cannot help yourself especially when considering about the consequences after publicizing injustice. You could be a hero in that moment, but when you face reality, you tend to accept the abuse of power,” added Dr. Lee Keunduk. Similarly, the way others treat the victims prevents people from asking for help about an incident. Victims usually blame themselves as people around them see the victims with jaundiced eyes. Even though the victims address an issue in the community, it remains as a stigma in the Korean society. In such a community, how can the people with less power publicize their stories? According to a survey responded by 268 HYU students, over 77 percent of students who experienced power abuse answered ‘Had no choice but to tolerate’. This result demonstrates the psychological factors of the victims described above. Such passive resistance affects the intensification of the perpetrator. As the psychological pattern of the perpetrators and the victims are repeated, the problem of misusing power continues to be vividly depicted until this day. Since it took a long time to achieve a high profile on the issue regarding power abuse, more time and courage will be needed for it to be solved, when it gets delayed. For the institutional measures, there are arguments over the abolishment of Korea’s ‘Libel and Slander’ law. “It seems inappropriate to abolish it without preparing any alternative. However, I believe the part of the judicial precedent, stating that the defendant is responsible for proving the justification needs to be amended. Moreover, I would like to suggest a new bill such as ‘those who are punished with criminal intent cannot be hired as executives of a company’, which is currently being discussed. However, when we make such a law, we must be careful not to go against basic rights, such as freedom of employment and the constitution,” said Professor Lee Jin-su. There are many opinions about strengthening sexual abuse punishment in Korea. Professor Lee Jin-su pointed out that the idea itself is appropriate as the level of the punishment is similar with indecent assault, which receives ten years in prison. However, since criminal law is the last measure, it cannot solve fundamental problems. Professor Kim Hack-jin encouraged the importance of controlling emotions especially when solving the problem, so that the power to resist authority does not grow into another form of power, which can turn into a force that creates conflict and division between groups. Power-based discrimination has always existed and has evolved in various forms. These days, everyone mentions it, which shows that the society has matured to the point where people can now define the issue and become enraged about it. In the process, the development of social networking services and technology, which are available at anytime and anywhere can help people to publicize the issue. However, rooted perceptions and ambiguous forms of power still allow people in authority to justify their power abuse, resulting in the ongoing incidents. To correct such issues, individuals must seek ways to improve their perception of power and the government should protect victims by encouraging them to communicate their damage under wellstructured power, so that it can prevent people from taking advantage of it.